Remember when In the year 2016... would have introduced filmgoers to a dystopian future? Welcome to it. Following the Alton Sterling shooting last week, some truly iconic images are coming out of the Baton Rouge protests you need to see. The image below by photographer Jonathan Bachman is already being hailed as "legendary." A protester blocking the highway in front of Baton Rouge Police Headquarters is arrested by State Police. No, no, no. Those "policemen" are not dressed for war. That's "modern sporting armor." 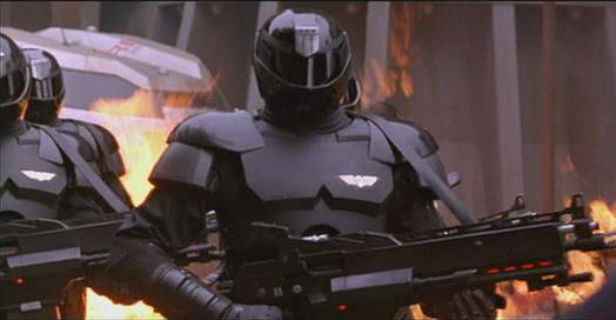 Or are they filming a Judge Dredd sequel in Baton Rouge? Where are the Lawmaster motorcycles? Are those Lawgiver pistols in those holsters? The single image above says everything about the lunacy behind turning your friendly, neighborhood, beat cop into a Stallone clone. Judge. Jury. Executioner. Isn't that how we got here in the first place? Prominent Black Lives Matter activist DeRay Mckesson is arrested (below) for obstruction of a highway. The eyes have it. And finally, this emotionally charged video clip. Over 100 protesters were arrested late Saturday and early Sunday.